Do you ever find yourself annoyed with the fact that you have to buy additional accessories and complementary tools to maximize the use of a product? For example, purchasing a projector doesn’t necessarily guarantee that you can open it right out of the box and display whatever you want. Often times consumers will find that they need additional cables and adapters to display a projection from their electronic devices. Sure, projectors these days come in compact sizes and are very portable, but the fact that the inputs require users to have an adapter of some sort readily available poses a red flag for some. Most pico projectors today have HDMI inputs, which then require adapters if users are to display multimedia content from a laptop, tablet, or smartphone. In a way, this can defeat the purpose of convenience, and ultimately introduces a problem with the product’s pitch. Interestingly, Asus has not yet revealed intricate specs such as the brightness, resolution, and the product’s availability. What we do know is that it boasts a 100% NTSC color gamut and a full RGB color spectrum support, both of which should create a vivider video-watching and game-playing experience. It can also serve as a 6,000 mAh charge station, as it has a rechargeable battery. The E1Z will most likely be around $200, as informed by Engadget. The real question here lies in how the E1Z compares to its competitors. Yes, it does feature a microUSB connection, but that doesn’t necessarily mean it is a revolutionary product. Sure, it provides users with an easy connection method, but users can get a substantially better experience with a different product using an HDMI adapter. 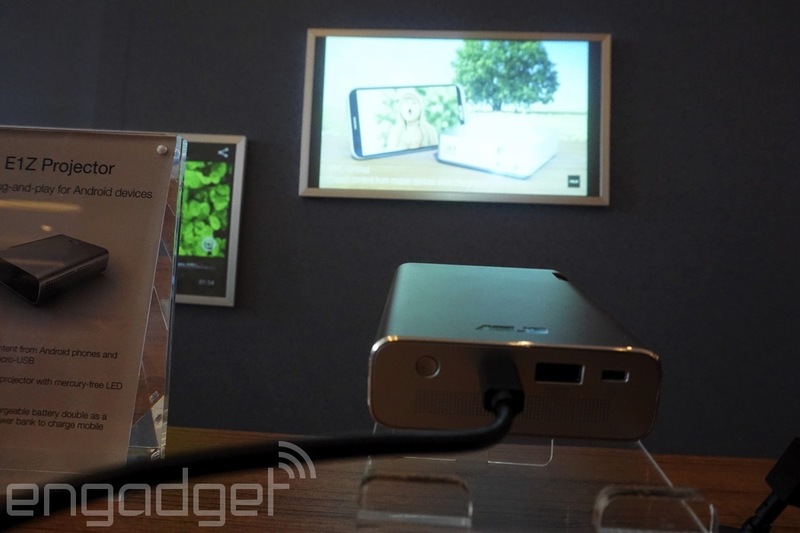 Assuming the E1Z is sold at $200, Asus looks to be putting out an affordable and easy-to-use projector for the traveling family or the entertainment enthusiast. It’ll definitely be a product worth experimenting with. Whether or not other competitor companies will follow in Asus’ direction of developing an adapter-free projector remains to be seen!